Mumbai, May 6, 2018: The OSCARS of real – estate industry had a thunderous opening, which had all the makings of the Biggest and Brightest Awards Ceremony of the industry. The impressive line – up of Who’s Who from the Government and Industry, across the spectrum, spoke volumes about the strength of Golden Pillars, leaving the august audience with several WOW moments. Anchoring by celebrities Mandira Bedi, Aman Varma and exuberant Ritvik Dhanjani was an interesting concoction of grace, wit and excitement. Dome @NSCI was packed to the full capacity with 1500+ guests, comprising of top Executives of Banks, HFCs, IPCs, Educational Institutes, Architectural Firms, International brands and allied industry players, thus representing entire spectrum of real – estate industry. Amidst gracious presence of His Excellency, Governor of Maharashtra, Shri C. Vidyasagar Rao, Shri Prakash Mehta, State Cabinet Minister of Housing, Govt. of Maharashtra and Shri Subhash Desai, Minister of industry and First Lady of the State, Mrs Amruta Devendra Fadnavis at the first Awards ceremony by CREDAI – MCHI witnessed several eclectic moments. I.A.S. officers Mr Ajoy Mehta, MCGM Commissioner, Dr Malini Shankar, Director General Shipping, Govt. of Maharashtra, Shri S.S.Sandhu, Additional Chief Secretary, Cooperation, Govt. of Maharashtra, Mr Gautam Chatterjee, Chairman, MahaRERA and Dr Vijay Satbir Singh, I.A.S. (Retd.) Member, MahaRERA presence in the biggest real-estate Awards ceremony was another feather in the cap. Mr Mayur Shah, President, CREDAI-MCHI said: MCHI is one of the oldest association with more than 30 years been rendering unparalleled services to the Real Estate Industry and all other stakeholders, thus touching upon lives of millions of Mumbaikars providing housing and workplaces for decades. 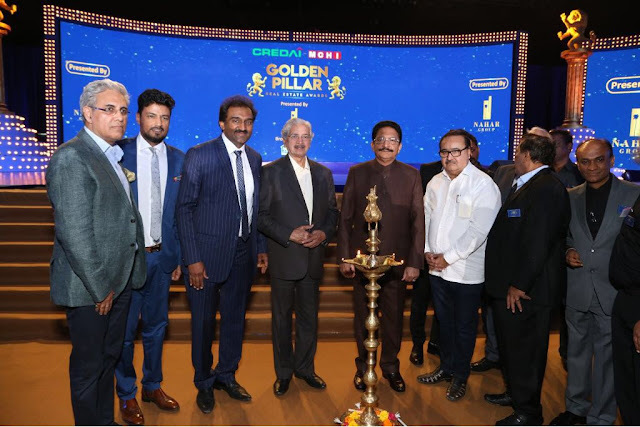 With Golden Pillar Awards we are celebrating excellence in the entire spectrum of real estate industry and this is the ultimate recognition of the efforts put in by the industry players. Mr S.B. Nahar, Chairman, Awards Committee, CREDAI – MCHI, said the awards are the culmination of a dream to celebrate excellence in real – estate industry. The awards were presented across all-encompassing and most comprehensive categories in the entire spectrum of real – estate sector. Mrs Amruta Fadnavis gave away Women Achiever of the year award and appreciated the efforts made by developers in creating Mumbai of today. Renowned Sand Artist Kaushik in a most outstanding Jugal Bandi of classical rendition by Vishal Kothari of Indian Idol fame and classic sand art, kept the audience mesmerised. Stand-up artist Dr Sumedh Shinde had the audience in splits with mimicry of Varun Dhawan, Hrithik Roshan, Aamir Khan and Nawazuddin Siddiqui. Emcee Ritvik Dhanjani, la Film Fare style picked up developers from the audience for some interesting conversations. The performance of Karishma Tanna on the medley of Bollywood melodies added appropriate glamour to the Awards.